John D. Lee was a native of Illinois. He joined the Mormon Church in 1837 or 1838 and in 1839 was sent on his first mission to an area that included Tennessee. Off and on for the next five years Elder Lee preached and baptized in Illinois, Kentucky and Tennessee. After the exodus, Lee settled in southern Utah. 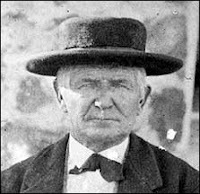 There he became the center of a tragic event called the Mountain Meadows Massacre in 1857. Though the level of his participation has been hotly debated, before he was executed for the killings, Lee left a book describing his side of the tragedy. This book, Mormonism Unveiled; Or The Life and Confessions of the Late Mormon Bishop John D. Lee, published in 1877, claims the Mormon Church was using him as a scapegoat. A few of the members and missionaries in Tennessee prior to the Massacre ran into opposition from people who had read it. Though it was not described frequently as a source of the problems in Tennessee, it did come up. Here is one example. In her journal, Mary Jane Miller wrote that a local man tried to get her family to not listen to the Missionaries by telling them about the horrible things the Mormons did at Mountain Meadows. He claimed to know all about it because he had read John D. Lee’s book. As family legend has it, my 4th great grandfather ran the missionaries from his farm with a shot gun because they "killed his baby sister." This is in reference to the MMM. It is said that the missionaries "shook the dust from their feet" at him. After much research on my part, I believe that she indeed was killed there, one of the young girls who went as a "nannie", but unnamed. I have always been interested in the MMM, but have not really known too much about the one in Tennessee. I love your posts, and have read them all! Keep up the great work! That is really cool. Stories like that make history more interesting than anything Hollywood could come up with.